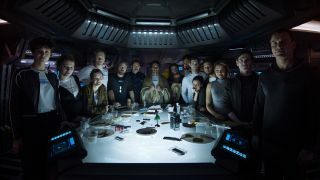 In a prologue to "Alien: Covenant" titled "The Last Supper," the crew of the spaceship Covenant get together for a final meal before entering cryosleep. In the latest installment of the "Alien" movie saga, another crew of space travelers inadvertently winds up face to face with some of the most horrifying extraterrestrial creatures Hollywood has to offer. "Alien: Covenant" delivers on the blood, guts and terror that anyone familiar with the franchise would expect, while tying up some loose ends from the 2012 pseudo-prequel "Prometheus." The film bridges the gap between the prequel and the main story line (starting with the original "Alien" movie in 1979), but if you're hoping it will clear up all the unanswered questions from the previous movies, you may be disappointed. The "Alien" movies are generally known for their gut-wrenching scenes of aliens violently bursting out of people's bodies, but "Prometheus" didn't live up to the gory standards set by its predecessors. Instead, the prequel focused on history, mythology and existential questions. So if you're unhappy with the lack of chest-bursting, face-hugging and blood-splattering alien encounters in "Prometheus," you'll be happy to see that Scott has returned to his old, gruesome style with "Alien: Covenant." "I hope the film gets people very uneasy, helps your arteries start pumping, sets hearts pounding," Scott said in a statement. "I hope you have a very dry throat but can't take your eyes off the screen." "Alien: Covenant" official movie poster. The story is set 10 years after the events of "Prometheus," with 2,000 aspiring space colonists hibernating in a state called "cryostasis" inside a spaceship named the USCSS Covenant as they travel to their new home, a distant planet named Origae-6. But during the trip, a stellar ignition — the birth of a star — causes a problem with the spaceship, and an android named Walter (played by Michael Fassbender) wakes up the crew. In the tradition of Sigourney Weaver, who starred as Dr. Ellen Ripley in the original movies, "Alien: Covenant" returns with a another dominant female character, named Daniels and played by Katherine Waterston. While working to repair a damaged solar sail on the spaceship, the crew receives a "rogue transmission" that sounds like a distress call from a human being and that's coming from a nearby planet. So they scrap the plans for Origae-6 and head to the source of the signal. Despite the crew's humanitarian intentions, this turns out to be a pretty terrible decision. After the USCSS Covenant arrives on this mysteriously Earth-like planet, it doesn't take long before xenomorphs start bursting from people's bodies, spraying blood in all directions and making the colonists regret paying any attention to that distress call.